The Polyken™ Probe Tack from ChemInstruments makes it easy to measure the tack of pressure sensitive adhesives. A precision ground 5.0 mm diameter flat probe contacts the adhesive, reverses direction and pulls away from the adhesive. The maximum force required to break the adhesive bond is recorded and displayed. 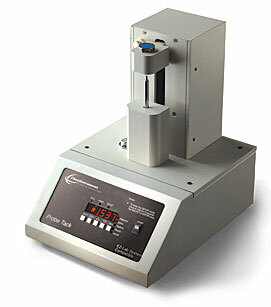 The Polyken™ Probe Tack adhesive testing machine meets the standards set forth in ASTM D2979. Machine speed is 24 ipm (61 cpm), probe diameter of 5 mm and an annular ring weight that applies 9.79 +/-0.10 kPa of force. An automatic test cycle produces a 1 second dwell time from the beginning of contact to the end of contact.